I have yet to meet someone in my life who doesn’t like fresh rolls. I have made this for many of my friends and they always get gobbled up! I have had the pleasure of hosting a few bridal/baby showers and these are always a big hit. They require a little bit of labour and love but they are quite easy to make! 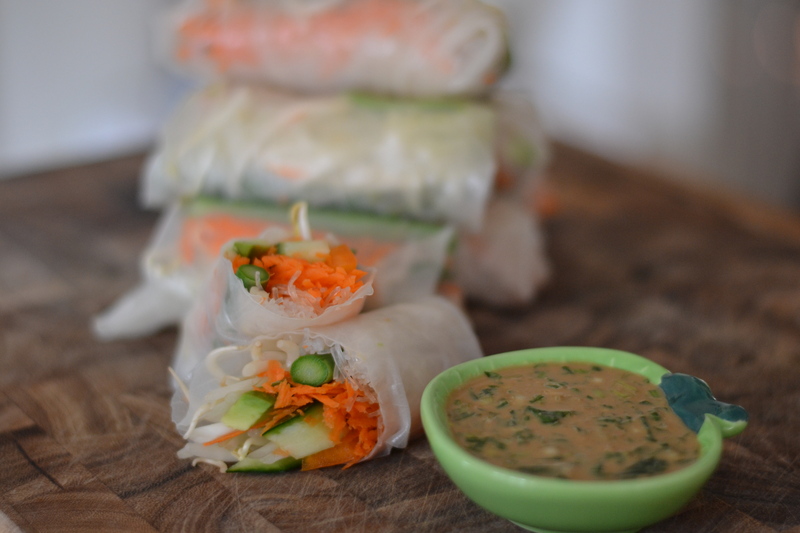 The secret is making sure you have a solid peanut dipping sauce – the vegetables and noodles inside the rice wrap are not seasoned, therefore the sauce has to be very flavourful to pack a good punch. Traditional Thai-style fresh rolls have a basil leaf rolled in them along with the veggies but my husband really doesn’t it so I omit it, but definitely use it if you like the taste of basil. You can pretty much put whatever kinds of vegetables you like in these rolls – you just want to make sure you cut them about the same size (it looks nice and also eats better) and try to choose a few different colours so that it is vibrant. Cooked shrimp also tastes great in these! It makes me sad that I can’t have shrimp anymore (after having pie pie I developed a new shellfish allergy…sad sad sad). 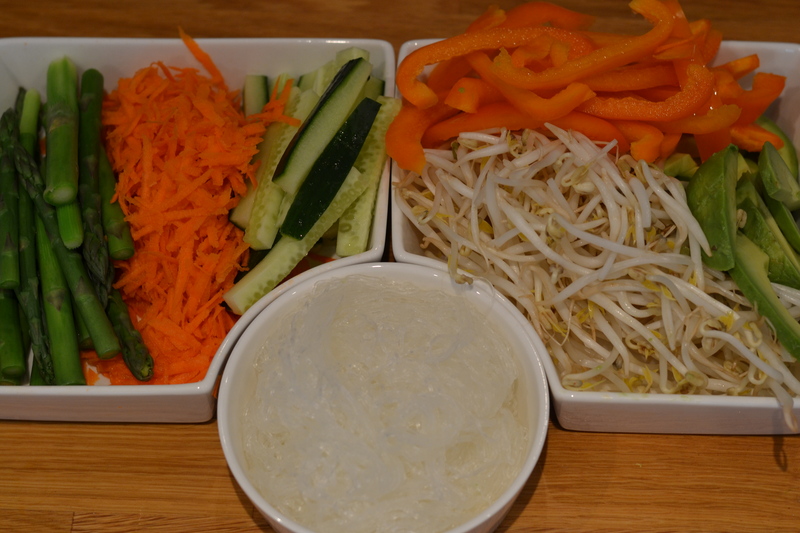 Since most of the veggies inside are raw and the rolls itself are quite big, it was hard for pie pie (my toddler) to eat so she ended up tearing it apart and dipping her veggies in the peanut sauce (which she loved). Fill your kettle with water and turn it on. 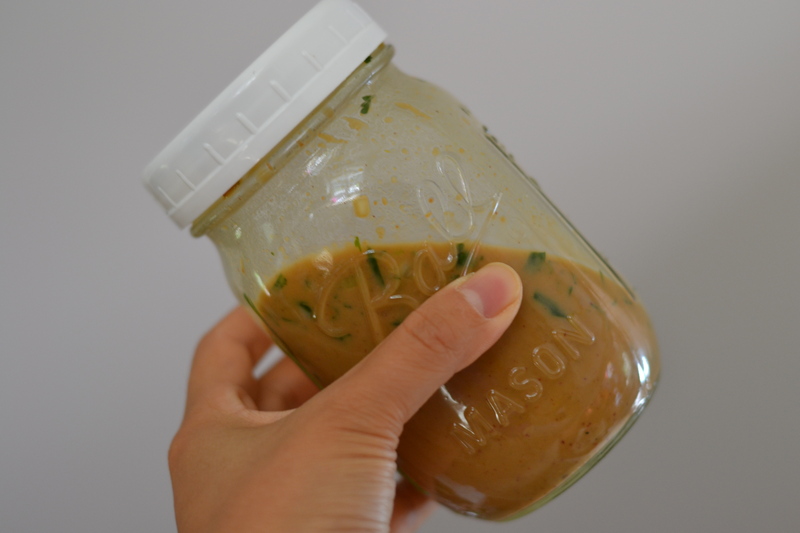 Mix all peanut sauce ingredients in a mason jar and shake vigorously. Store in the fridge. Prep all your veggies first – wash them thoroughly, peel the ones that need to be peeled, then cut them into long strips, about 2/3 of the diameter of your rice paper. I decided to grate my carrots because carrots can be a little hard, and I wanted some different textures in my fresh rolls. Set aside for your assembly line for rolling. For the asparagus, while you can eat it raw, I find it to be a little hard to eat that way and prefer to blanche them just to soften them a little bit. To do that, bring a pot of water to a boil, add your trimmed and cut asparagus, and just let them cook in the boiling water for about 30 seconds – 1 minute – they will turn a bright green. Remove from heat and set aside. In the same pot of water that you used to cook the asparagus, add your noodles (just a small bundle, about a handful). Rice noodles and mung bean noodles cook very quickly, in about 1-2 minutes. Remove from heat and set aside as well. Set up your station to roll by placing a large cutting board down and the veggies & noodles in front of you. In a large shallow pan or dish, add hot water (from your kettle) – if it’s too hot then just let it sit for a moment – you need the water to be hot but not scalding…Carefully take one rice paper sheet and gingerly place it in the water but make sure you keep holding the top edge of it and start rotating it so that all edges touch the water. When it becomes pliable it’s ready…if it is immersed in the water too long it will just tear. This part requires a quick, gentle and deft hand! It might take practice (the first few times I made these I threw away a bunch of rice papers!). Place the rice paper on the cutting board and place one of each veggie and a little mound of carrot/sprouts about 1/3 of the way up from the bottom. 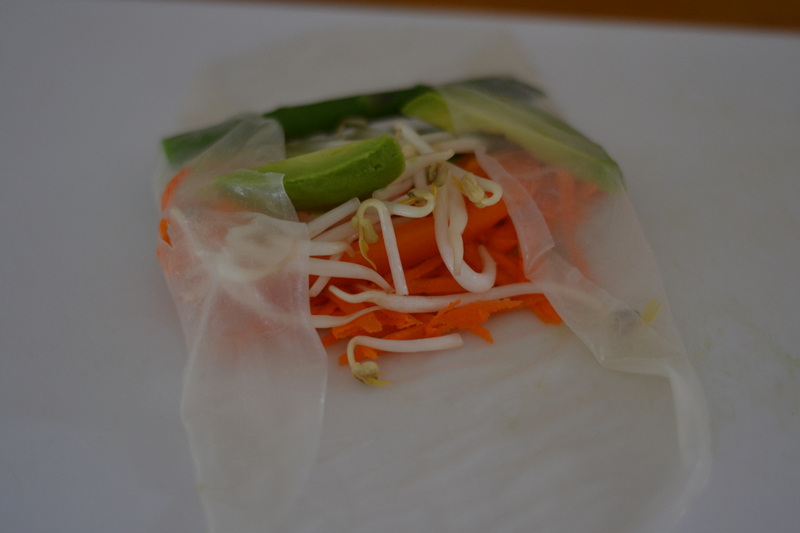 Fold from either side, then lift the bottom and tuck and roll tightly – the rice paper sticks to itself very well. Again, if it’s been in the hot water too long (or if your water is too hot), it will likely tear. Don’t worry, just keep making them and you’ll get the hang of it! The first few might not be the prettiest but hey they all taste the same! If you are eating them right away, just place them onto your serving dish and stack them up! If you are serving them later in the day or even into the next day, be sure to store them in an airtight container with a wet paper towel. They taste best fresh but sometime I make extra for lunches the next day so the paper towel does do the trick. Serve it up with the peanut dipping sauce. Enjoy!